Listening to books is an interesting experience. I think you take away different things, and the performance can really sway one’s opinion on the book. However, it’s a wonderful way to discover more literature and take time otherwise spent driving to enjoy a book. My Sister the Serial Killer ended up being one of my favorite books of 2018, and the Audible performance was excellent! Oyinkan Braithwaite is a Nigerian woman who hasn’t previously written Nigerian characters which is clearly where her gift lies. I listened to a recent interview with her on Belletrist (an Instagram book club community that does a monthly selection) and she said previously all of the characters she wrote were white due to half of her life being spent in the UK. It was interesting to hear her speak about that gravitation because I have always found myself gravitating to white characters, and I’m making a point to branch out this year, not only reading more widely in the nonfiction, mindfulness, memoir world, but also read characters of different backgrounds and cultures than my own. Braithwaite’s writing is so lyrical and gorgeous, it could only be created by a poet. I laughed, and cringed my way through this dark tale. It had me thinking deeply not only about morality, but also about what it means to be a woman in various places in the world and how can vary so vastly from our experiences in the US. 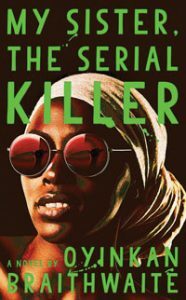 My Sister the Serial Killer begins with our protagonist, Korede, a successful woman, in the running for Head Nurse at her hospital and secretly in love with one of the doctors. She is also the older sister in a Nigerian family, the one responsible for her younger, more beautiful and beloved sister, Ayoola. But does this work the same way when your little sister is on her third kill, therefore officially making her a serial killer? This is Korede’s dilemma as we enter the story and as she helps get rid of another man’s body. What follows is a story of the bonds of sisterhood versus the moral compass. It will leave you with your jaw dropped wondering what lengths you would go to if the person closest to you happened to be a serial killer. Have you ever been so wrapped up in someone after a few days that you were convinced you were meant to be with that person? That’s how the protagonist of Ghosted, Sarah, feels as we enter the story. She meets Eddie, and it’s like they’ve always known each other. They spend a perfect week together, but then he disappears. He doesn’t respond to any of her increasingly desperate texts, calls, and at one point she even goes to Facebook to find answers. Sarah is going crazy, knowing they shared this connection, and she didn’t just invent it. However, as she continues to wonder if it’s just her, or if something has happened to Eddie, strange things begin to happen. She feels she is being followed, and there is even a phone call one day, telling her to stay away from him. Sarah begins to suspect there is a bigger reason for his sudden disappearance. 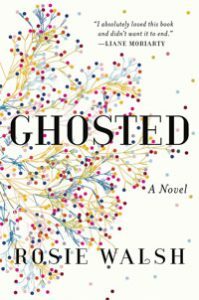 Ghosted was my other favorite read of last year. It’s a powerful story for so many reasons that keeps you guessing while following a cast of fascinating characters all with their own issues and baggage. It’s the type of story that makes you feel so deeply, I cried (a lot), and laughed, and related to Sarah as she unravels the truth. I could not put it down, and I can tell you with certainty that this is one story you won’t guess the ending to.